This recipe kit makes a light, refreshing mead. Hydromel literally means "Honey Water" in Greek. The term "hydromel" is a way of describing the low strength of alcohol in this mead kit. 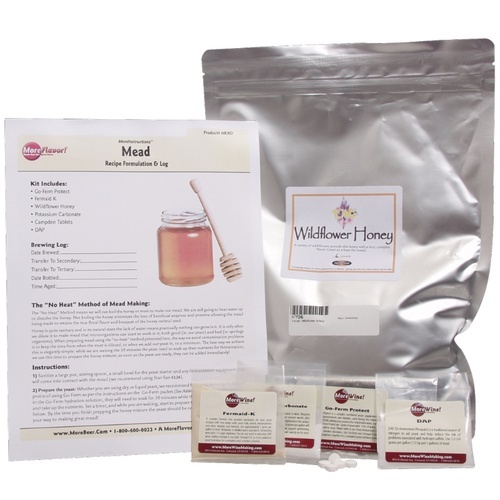 This kit is a very basic introduction to mead. Estimated alcohol is 5-7%. A perfect choice to carbonate in the bottle or kegs. The possible varieties are endless! This kit has everything you need. This was the first mead I had ever made. I enjoy the session style hydromel over the high alcohol meads, and it was ready in 45 days. I back sweetened with a half pound of honey using sulfites and sorbate, kegged it, and bottled with my beer gun. This mead got rave reviews at our beer tastings for our upcoming nano brewery here in Knoxville, TN. Good kit all in all. A good gluten free option over ciders.